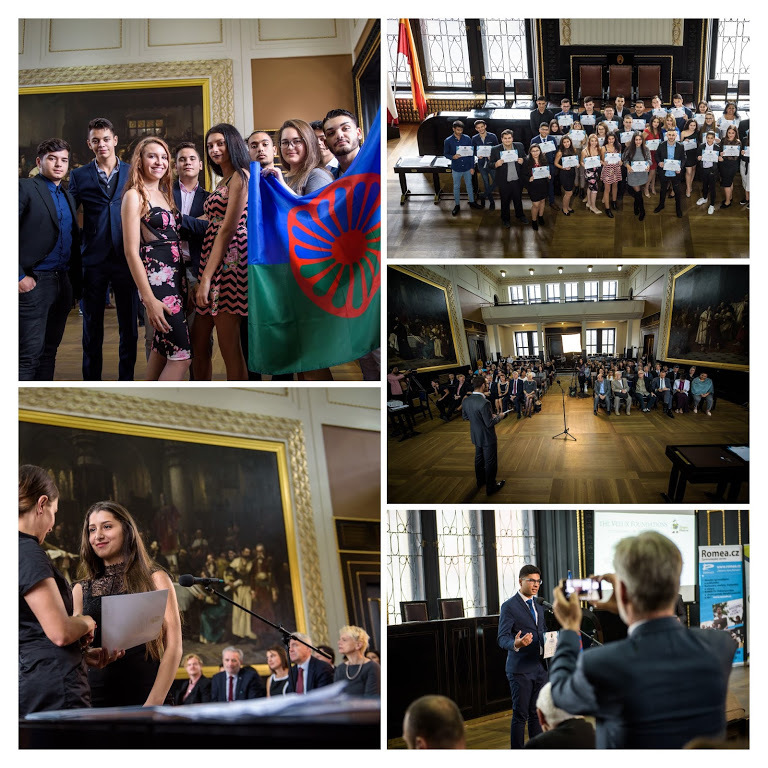 On Friday, 19 October, the celebratory gathering of Romani students who have been awarded scholarships through the Romani Scholarship Program for the 2018/19 academic year took place at the Old Town Hall in Prague. The program is in its third year of implementation by the ROMEA organization. Inspiring speeches were made during the event, for example, by the Prague City Councilor responsible for culture, Jan Wolf, who provided his auspices, as well as by the Secretary of the Federation of Jewish Communities in the Czech Republic, Tomáš Kraus, and Martina Horváthová, the vice-chair of the Czech Government Council for Romani Community Affairs. The event was moderated by Lukáš Kotlár, a student of international relations and political science. "I greatly appreciate all 150 students, including the 90 of you who applied for a scholarship this year but did not receive it, for deciding to even apply to the program at all. I am calling on you all not to be afraid to apply in the years to come. The most important thing in society is to take care of education," Wolf told those assembled for the ceremony. Prague City Hall provided not just its auspices to the event, but also the dignified, impressive meeting spaces of the Old Town Hall. Tomáš Kraus also addressed the students and their parents. "Our two communities, as is known from history, have always ended up on the outskirts of society. The majority society has not always treated us as we imagined a majority society should behave. The key to us convincing the majority society of our qualities is education," Kraus said. Robert Tobon of Bader Philanthropies, which also supports the scholarship program, addressed the students and their parents as well: "What we are supporting through the ROMEA organization is not just the spreading of awareness about these students' efforts through their media trainings, but also these students being able to set higher goals for themselves. Each person achieves his or her education thanks to the contributions of others. Their family, the community itself, and their friends contribute a great deal." The vice-chair of the Czech Government Council for Romani Community Affairs also had words of encouragement: "Education is the way out. It is the way toward opportunities that we should cultivate and the way to overcome all the barriers that life may throw our way. Let's take those obstacles as a challenge to become even better, to overcome something that others may not have to deal with - because even if their path is easier, it means they actually lose the opportunity to improve, to become even stronger." "Keep looking for what connects us, not what divides us. Tell people you are Roma. Be proud of it, and have a healthy degree of self-confidence. You have nothing to be ashamed of. In addition to living in the Czech Republic and declaring yourselves Czechs, you are also Romani. You have something extra compared to the other Czechs who live here. I recommend you look at it that way. Don't look for the disadvantage, find the challenge, find out what it is that you have that is extra," Horváthová told the students. "I believe you will motivate those around you." This academic year ROMEA will support a total of 60 high school and higher technical college students all over the Czech Republic, including students at college preparatory schools and conservatories as well as those studying security and law, social sciences, or technology. Most of the students were awarded the scholarship during the last two years as well, with roughly 15 receiving the scholarship for the first time. "The purpose of the scholarship program as a whole is to support Romani students on their path to education. Many of them encounter an enormous amount of distrust from those around them - they hear daily in the Czech media what kind of people the Roma supposedly are or are not, and they feel great pressure over the idea that whatever they do will be associated with their ethnicity. The ROMEA organization, therefore, is doing its best to support their academic achievement by increasing their belief in their own abilities, their pride in their Romani origin, and the economic, political and social strength of Romani men and women as individuals and as representatives of Romani communities," program manager Jitka Votavová explained to news server Romea.cz. The scholarship recipients are chosen on the basis of assessments made by a three-member commission that scores the extensive applications submitted by the students. The applications include information about the student's academic achievement, a description of his or her living situation and the reasons he or she is requesting the scholarship, as well as his or her motivation to study and information about extracurricular activities or successes achieved beyond the usual framework of studying. More information about the scholarship program is available (in Czech) at www.romskastipendia.cz. The program is implemented by the ROMEA organization with the support of the Velux Foundations of Denmark, the Albatros Foundation of the Czech Republic, and other supporters, including individual donors.